NASA's Axelrover is a whirling robot designed for the most challenging terrain on the Moonand beyond. NASA refers to a robot like the Axel rover as a 'tethered marsupialrover' because it would spend most of its time attached to a larger vehicleuntil it is needed. The Axelrover prototype is built like a yo-yo; its tether is wrapped around itscentral axle. 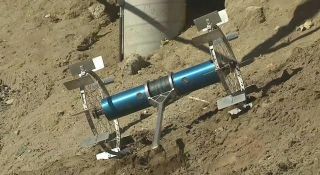 The other end of the tether would be attached to a larger,conventional rover robot, like the Spiritand Opportunity rovers on Mars. The Axel rover solves a problem that bedevils theseconventional robots. When Spirit, for example, encounters a crater, it cannotdescend and explore. However, the Axelcan; it lets gravity pull down, whirling the rover around. It uses its arm togather samples; its stereoscopic cameras gather visual details. When it hasfinished its duties, it can wind itself back up to the top, to be stored againfor later use. "Right now, it'sreally risky for astronauts or robots, for example, like Spirit an Opportunityto go into craters. The ground is too loose and the slopes are too steep. Soit's too risky for those robots to get into those craters and perform anyinteresting science. So this robot would be very useful for those types ofscenarios, where you can really dive into those craters, pick up some samples,and really analyze them and tell us something really new and interesting aboutMars or the moon, for example." The Axelrover is really a marvel of simplicity. With just three actuators, it cancontrol its wheels and trailing link. The robot can pick and choose its waydown a slope, even turning in place if necessary. "Axel can readilysupport different wheel types and sizes ranging from large foldable wheels toinflatable ones. In this way, it can traverse steep and rocky terrains, andtolerate strong impacts during landing or driving. Additionally, Axel isdesigned with co-location of its sensors, actuators, electronics, power, andpayload inside the central cylinder. This configuration provides compactnessfor launch, and robustness against environmental extremes in planetarymissions." The whirling Axel roverreminds me of those wonderful whirling tripedal spiderrobots from ArthurC. Clarke's 1972 novel Rendezvous With Rama. Future of Mars Exploration: What's Next?